Not much is known about St. Peter Chrysologus (c.406-450) except that he was born and died in Imola (Italy), and was Archbishop of Ravenna from 433 to 449. Over 170 sermons are attributed to his authorship, of which this manuscript contains 76; it is perhaps therefore the first volume of a two-volume set. It is probably written by the same scribe as British Library, Royal MS. 6 C.viii, which comes from the Cistercian abbey of Rievaulx, in Yorkshire. The letter 'X' (or the Greek letter 'Chi', which is written like an 'X') is uncommon at the start of a word, but occurs as the first letter in 'Xps', a common abbreviation of 'Christus', Christ. 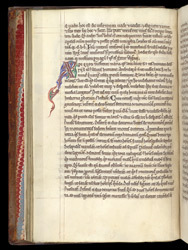 This 'X' can be compared with one in the Rievaulx manuscript which was apparently written by the same scribe.